It was wonderful to see so many families this past weekend! Family Weekend is such an amazing time. Hope you enjoyed every minute! Today’s Daily Deac is a guest blog by Matthew Connor ’18, Wake Forest Fellow in the Office of the Dean of the College. Enjoy! 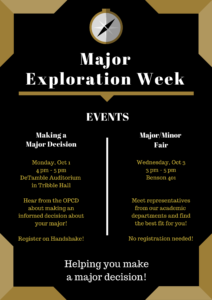 Major Exploration Week is an information campaign to empower students to think critically and carefully about majors and minors at Wake Forest. The Major Exploration Week team has worked for many weeks to design programs, flyers, and informational emails to help our undeclared undergraduate students understand what majors and minors are, where to find information about the majors and minors offered at Wake Forest, and who can help guide them in the exploration process. Our key event is the Major & Minor Fair hosted by the Student Government Academic Committee which connects students with representatives from our academic departments. Students will be able to learn about major and minor programs directly from faculty in the departments and make valuable faculty connections. We are also hosting the Making a Major Decision event via the Office of Personal and Career Development which is designed to help students understand the most effective ways to think about majors and minors and to help students make informed and insightful major decisions. Our information campaign is centered around our daily Major Exploration Week emails, which run from Sunday, September 30th through Saturday, October 6th. Each day, the Major Exploration Week team will send undeclared students a brief email with key information related to five important questions students should ask about exploring majors and minors. 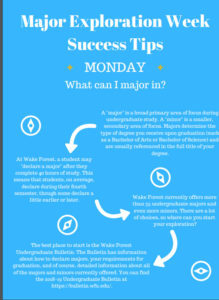 Each email also includes an interactive “Success Tips” PDF with links to important resources and crucial information for exploring majors and minors. Our team hopes that this week will help students feel informed, supported, and empowered as they explore majors and minors and give them the tools they need to feel confident and excited about their futures. The Major Exploration Week team is comprised of representatives from the Office of the Dean of the College, Office of Academic Advising, Office of Personal and Career Development, and Student Government Academic Committee.